ELINA GAZED OVER HER SHOULDER. The village she had known all her life receded into the distance. It’s strange to think I might not be back for a whole year. Below the flying carpet, early morning sunlight reflected off the river, illuminating the haunt of the river fairies. Her father urged the carpet onwards and upwards, and the sound of rippling water faded. “Yeah, I think so.” Elina wriggled onto her stomach and peered over the edge. The ground whizzing by made her stomach lurch, but all her bags were safely tied underneath with strong leather buckles. Her father normally used this family-sized model to transport stock for the flying carpet shop. “Good.” Her mother wore a satisfied smile. As the magic carpet gained height and speed, Elina shivered in the chill air and wrapped her wool cloak tighter. Fields spread out below became a mottled greeny-beige patchwork. The sensation of flying always thrilled her: the taut fabric gliding along effortlessly, and the wind whirling wisps of her long black hair around. It wasn’t often she got to do an hour’s journey; it had been eighteen months since they last visited Aunt Clauda. The village of Darien—low houses and farmers’ fields—disappeared behind them. They followed the river, the rising sun making Elina squint in the pinky light. It would be at least half an hour before Kamikan came into view, with little to see except the winding river and fields. Father probably thought it was the ideal time to remind her—yet again—of his expectations. “I already said I’ll work hard at magic lessons.” Elina tried to keep her voice neutral, restraining from adding a sigh. “I did practice at home.” She scowled at his back. “Magic’s difficult.” At least, it is when you’re trying to teach me. She sighed. Father didn’t seem to take subtle hints, and she’d been trying to persuade him for months that she wasn’t interested in the shop. Elina kept her face blank. She couldn’t see how spending hours patching dirty rugs would make her enjoy it. “I’m sure Elina will do better in a school environment.” Her mother shot her a brief smile. There’s no way I’m staying in that dusty old shop till the day I die. Why didn’t he ever listen to her? Not once had her father ever asked her if she wanted the shop to be her future. He just assumed she would dutifully follow in his footsteps. I want to see the world before I have to settle down to the dull kind of life my parents have. Still, she’d managed to persuade Father it would be better if she had magic lessons in town—with a proper teacher. Thankfully, Mother had agreed with her. Mother wasn’t much good at standing up to Father, but she knew how to get round him. Elina hoped she’d get to work on some other magic as well, instead of just those stupid carpet charms. Then, she’d have more idea of what alternatives there were to staying in the shop. “I’m looking forward to magic school.” That wasn’t a lie, at least. “Yes, Mother.” Elina tried to keep the impatience out of her voice. She was embarking on the biggest adventure of her life, and all her parents could talk about was work and chores. Typical. Not long afterwards, the grey line of Kamikan appeared on the horizon. As they drew closer, the line expanded, and tall, yellow stone houses came into view. Black specks filled the sky: carpets heading for town from all directions. Elina’s stomach fluttered at the thought of all those people. It would be fun to see new faces. This Festival weekend—the autumn equinox—meant her father had closed the shop for the day so they could take her to Aunt Clauda’s. Perhaps they’d be able to go to the firework display later on. It would certainly make a change from Festival in the village, where the day’s highlight was guessing the weight of old Mrs Falen’s pet goat. They flew closer, sailing over the outskirts of Kamikan, and Elina could pick out individual buildings and look into the gardens. The large houses had sizeable courtyards with palm trees in the centre. High arches were set into many buildings, with the tantalising sound of tinkling water from fountains. Kamikan seemed bigger than she remembered. Elina hung over the side, wondering if any of these buildings was her magic school. Her aunt hadn’t mentioned anything about the place, just that she’d fixed something up. How would she ever find her way around such a huge city? Elina shook her head. It’ll be fine. At least there would always be something interesting happening in town. “Down.” At a word from Elina’s father, the carpet descended. They sailed over the sloping red roofs and headed for the heart of the city. Other carpets flew by, most heavily laden like theirs. Elina spotted one of the new sporty models Father had got in the shop recently. Wafer-thin and pointed at the front, she gasped as it overtook all the others and banked sharply towards the ground in a sleek manoeuvre. Her father decelerated their grey utilitarian carpet to keep within the city speed limit. “I suppose. Down.” The carpet dropped further. They travelled along the main thoroughfare, through the cheerful yellow buildings, flying level with the top storey. Below them lay a street market with rails of caftans and shawls displayed under striped canopies. Shops lined the main road, and people dashed in and out of the bakers, grocers and confectioners. People were dressed in either loose pants and flowing tunics, like Elina, or the more traditional red and yellow caftans which often came out at Festival. Elina’s stomach growled as they passed the baker who stood outside his shop with a floating tray of mini cream cakes, handing them out to passersby. Shame her Tangible wasn’t good enough to whizz one up to her. Elina lay on her front again. A man strode up the road with a whole procession of crates levitating in front of him. He made it look so easy, and she’d struggled to get that stupid doormat off the floor. Winding cobbled side streets showed glimpses of bookshops and household wares. Elina craned her neck and spotted a china shop and a musical instrument store. Beyond, sat an open square with a large fountain in the middle, where a dark-skinned dancing girl spun and twirled with coloured spiral ribbons. A young lad directed jets of water from the fountain over and around her, not hitting her once. Elina glared at his back and caught her mother’s eye. Her mother gave a quick shake of her head, and Elina bit back the hasty retort that had risen. She didn’t want to risk her father turning the carpet around and going back to Darien. Plaintive music drifted from the square, but they flew by in a few seconds. “Oh, can’t we stop and look around?” Elina begged. “No, I want to get to Clauda’s. There’ll be time to go out later in the day.” Her father pushed the rug onwards. A street merchant’s display filled the road ahead and people crowded around, buying fireworks for the evening festivities. The salesman’s cheery voice projected far and wide. “Ladies and gents. Finest fireworks here! Make your display tonight go with a wallop!” He started letting off bangers to demonstrate. A loud zap went off right underneath them, and Elina’s father cursed. Elina let out a giggle. Elina stared around. The glint of water in the distance must be where the docks were. There appeared to be some kind of seating under construction near the river. She couldn’t work out what it was from here. Elina’s mother pointed. “Over there.” Aunt Clauda’s thin townhouse was visible, unusually painted light blue. They flew closer, and the chipped brickwork and shabby paint stood out. A large garden sprawled beyond the house. Bougainvillea climbed the fences with abandon, and weeds ran riot. Vibrant purple and green caftans spun on a clothes line. Elina’s father eased the carpet down onto the landing pad—a large clear rectangular area directly behind the house—until they hovered a foot above the ground. Elina jumped off and stretched her legs, unbuttoning her cloak in the morning sun. The scent of flowering grasses rose around them, making her mother sneeze. The back door opened and Grace, her aunt’s stout housekeeper, waited with a smile. Elina hurried over to greet her. Grace felt like the closest thing she had to a grandmother, even though she was no relation. Elina’s father leapt off the carpet and turned to unstrap the bags. “Yes, it was busy on the way in,” Elina’s mother said. The back door led straight into the kitchen. Sunny yellow and white wallpaper covered the walls, but edges peeled off here and there. Elina trod in the smooth dips in the floor tiles, where countless footsteps had worn them away. A sense of overwhelming freedom came over her. She darted into the kitchen and caught Grace around the waist, causing her to fumble the glassware. “Elina, what’s got into you?” Grace laughed, placing the glasses on the rustic table. “It’s so nice to be here instead of stuck in Darien.” Elina spun round the kitchen, poking her nose into all the various pots and pans simmering on the stove. “Her letter said she sold quite a few pieces.” Elina’s mother sipped her lemonade. Aunt Clauda was an artist. Elina loved her paintings—abstract nature scenes—but her father described them as smears that vaguely represented landscapes. Her aunt had what people called an artistic temperament, what her parents called an eccentric nature, and what Elina called slightly crazy. Elina wondered if it would be weird staying for a whole year, instead of a short visit. Would her aunt seem different? Either way, though, it would be better than living with Father. The crash of the front door interrupted Elina’s thoughts. A further bang startled them all. “I’ll go.” Elina rushed out to the front hall. She found Aunt Clauda and five baskets—two of which now had their contents scattered liberally over the floor. Elina ran to pick up potatoes and apples from the dusty hallway corners. “We were all up at first light,” Elina said. “There was no reason to hang around.” She hugged her aunt and breathed in the familiar heady, floral odour of her aunt’s perfume. Aunt Clauda was a few years younger than Elina’s father—her brother. She wore striking metal-rimmed spectacles on a bronze chain. A long flowery scarf hung round her neck, more often than not trailing behind her. Her clothes had zigzag patterns in bright colours. They suited her, but Elina couldn’t imagine wearing them herself. Aunt Clauda led the way, passing in a rush of perfume and patchwork, her ancient purple cloak billowing out. “Yum.” Elina picked up a basket and peered under the lid at the dessert. Soon they were all seated in the kitchen around the long, wooden table, drinking Grace’s lemonade. “So, Mikal, how’s the shop?” Clauda asked. “I found someone to take my place.” Elina said. “I’ll tell you all about him later. 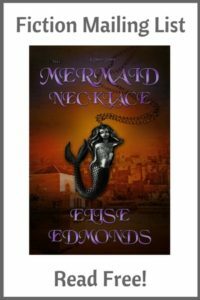 But I know he’s a good teacher.” Aunt Clauda spoke lightly, but she stared at Elina as she spoke, and there was a glint in her eye that told Elina not to ask any more questions for now. Elina’s stomach dropped. She’d set him off on another lecture. He continued. “I’ll come back and visit in a few weeks’ time. I have to make that overseas trip to Pallexon before the winter weather sets in, to stock up on carpets. I shall want to see you’ve learnt something useful by then so I’m not wasting your time and my money. If not, you’ll have to come back home.” He gave her a sharp stare then started scanning through the bulletin. Elina saw Aunt Clauda exchange a look with her mother. Her mother gave a barely discernible shake of her head. Elina stifled a yawn. Father always found something boring to talk about—couldn’t he forget about business just for one day? Elina couldn’t hold back a yawn any longer, and her father glared at her. “Then you’ll have to build up the maintenance side of things,” Aunt Clauda said briskly. Her father grunted and flipped over the newspaper pages. “Okay, thanks.” Elina got up from the table with a sigh of relief. Somehow, her father always managed to make things feel tense. She couldn’t wait to have a break from him. 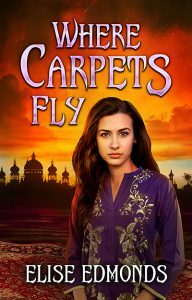 Buy ‘Where Carpets Fly’ on Amazon TODAY!